NOTE: The "Start" mat failed to work, so the "gun" time above is my time assuming I was at the front of the line. Of course, there was a gap between the gun and when I actually crossed the start line, thus beginning my timing. Luckily, I used my Nike+ kit pretty adeptly during the event, so I actually have a more accurate (though still not the best) time to report. Oh well, I shouldn't be obsessing about such small things anyway. I have attended two of these Nike runs before, though only as a spectator. The former 10k distance of the race seemed daunting before I took up running as a hobby. So I would join my other non-running sisters for breakfast once the race started and finished before the race's end. No more of that. The only breakfast I wanted was the runners' post-race breakfast. So I joined my sister's co-worker's team and continued training on the half-marathon program I was already on, although I did back off a bit during the week of this race in order to stay as fresh as possible. The packet pick-up was at various locations at various times, but we chose to get ours a week prior to the race at a Sport Chalet. There, we obtained our PERFECT shirts and free samples of Jamba Juice. I was also convinced by a Nike+ shoe guy that I should see if Nike shoes will work for me, since I had always thought they were meant for more narrow feet. After a long wait, the race began with Blu Cantrell singing the national anthem and "Hit 'Em Up Style." I started off just making sure I didn't get burned by too many people. Finished mile 1 in about 9 minutes. Same for mile 2. By then, I was starting to feel tired and overheated (it was probably approaching 76-80 degrees by then). Not accustomed to running sub 10-minute miles for that long, I thought about walking so many times. We turned around, so most of the remainder of the race brought on the same sights and bands. I passed Naughty by Nature, The Sugar Hill Gang, Dawn from En Vogue, and finally, at mile 4, Sir Mix-a-Lot. At this point, I was getting a stomach ache, although I hadn't eaten that morning. I was hunched over and badly wanting to walk, but I pushed on and just slowed down on and off. Finally, I hit the coliseum, where the downhill slope sent me rolling toward the finish line. The clock said 45:55 when I crossed the line. Regardless of what that equates to in official time, I am happy that I (at least) met my 45-minute goal. It seemed a bit lofty to me beforehand, since this was my first short race. Short races are scary because the strategy is quite different... it's not just running as slow as necessary to get to the finish. There was actually some pride involved here, since I think I expected to do well because of all the running I've been doing. Post race, we were treated to Jamba Juice (Nike Protein Berry Workout), numerous pastries, pancakes, fruit, sandwiches, yogurt, oatmeal, and even ice cream bars and beer. I stuck to most of a banana, half a mini Clif bar, some yogurt, fruit, and pickings of the pastries. I was so sick from cramming the banana down so quickly that everything else did not settle well, or else I could have eaten a LOT more. I didn't even have any muffins, scones, or crusts of peanut butter sandwiches. 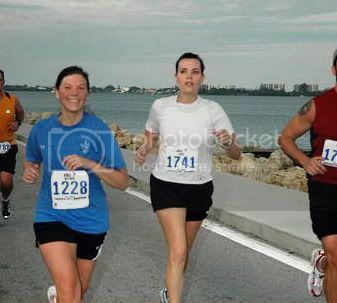 This race has inspired me to keep training for the half-marathon I have next month. I really want to PR, so that means I need to train harder and take better care of myself in the process. I also hope to obtain a good visor by then. Running without one today was not the best move. Does anyone have any recommendations for this iPod before I go out and spend the money? 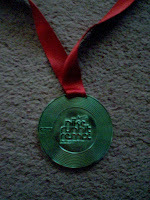 Congratualtions on the Nike Run. I did it down here in Miami last year and it was at night, was yours during the day? I love that race, although I dont think they are doing it here this year. It was blast with all the bands.